Good Monday morning! Or afternoon. Let's be honest, I probably won't get my act together until after lunch today anyways. I always try to take the whole "Monday is a clean slate" attitude, but it apparently takes me at least two cups of coffee and half a day to get my chalk together. did I just take that metaphor too far? It is a metaphor right? Similes use the word "like" right? Wow. Okay, so my attention span is on point today. Since I can't keep it together + completely failed at last week's wishes, I'm going to be obnoxious + share this past weekend as it looked through my Instagram feed/camera roll. Ready, GO! top row :: I asked my mom if we had any pictures of me completely terrified of Santa, turns out, we've been pals since day 1! | the picture that would be my Christmas card if I had acted fast enough to send them out, on National Ugly Sweater Day! even though all of my sweaters are adorable. | only the prettiest new lens for Ringo the Rebel..
What did everyone else get into this weekend? CAN YOU BELIEVE CHRISTMAS IS NEXT WEEK? TWO WEEKS FROM TODAY AT THIS VERY MOMENT I WILL ON MY WAY TO HARTSFIELD JACKSON INTERNATIONAL AIRPORT WAITING TO BOARD MY FLIGHT TO AMSTERDAM. holy moly. sorry for yelling..
Hahaha, that is so me too on Mondays! I feel like it takes me till about noon to really get going and by then it's time for lunch, oops! ;) Love your pictures, the ugly sweater 5k sounds like the best 5k ever! New lenses are the best! Good choice on the 50mm :) I seriously have no idea how Christmas is nearly a week away. I still haven't finished Christmas shopping or any other planning for that matter. Yikes. 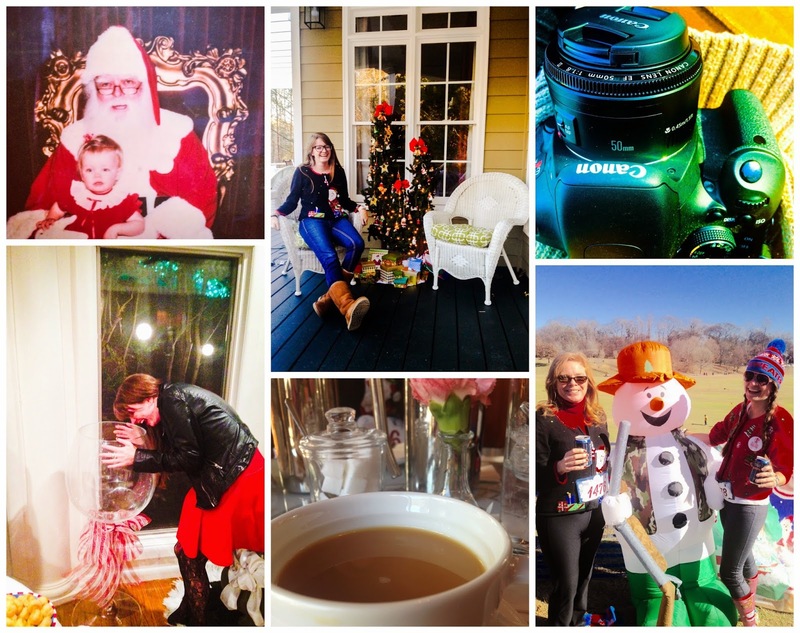 This collage perfectly sums up why I love the holidays so much! best weekend ever! AAAANNNDD Tacky sweater party tonight (take lots of pics for me so I can live vicariously through you) hahaha. remind me to sign up for that 5k next time. looks like tons of fun! I love the lens! I love how lightweight it is. I haven't even STARTED my Christmas shopping... oooops! oh why thank you! it was a fun weekend for sure. also I will instagram all the things tonight, don't worry.